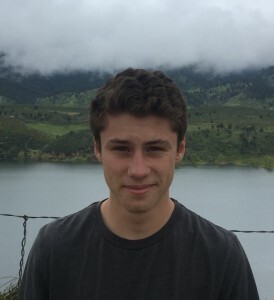 Jake Pritchett is a junior at Poudre High School in Fort Collins, Colorado. International travel and an IB education has given Jake a curiosity of foreign culture–so DoveTales seemed especially compatible. Initially, Jake heard of the contest from a family member. Jake became interested in the issue of immigration, especially “illegal” immigration, because of its use in political discourse today. The issue, however, became much more emotional when he learned about the stories of immigrant’s journeys both in his community and worldwide. Because of his mother, a writer, Jake (being a rebellious teen) was initially off-put by writing. In time, however, he found stories inescapable. In the future all Jake hopes to do is to write, and write well. This publication has, without a doubt, bolstered his confidence and encouraged him to continue to write. Here, we see a young Mexican immigrant, battling hunger and exhaustion after a 2-day bus ride from Mexico to a town in Colorado, where his uncle lives and works. We feel this young man trying to regain both physical and spiritual equilibrium despite tremendous vulnerability. I admire the writer’s ability to describe the character’s psychological and physical landscape, and how he makes us love the main character through his use of specific, astute observations. Pritchett’s winning story will be featured in our 2017 edition of DoveTales, An International Journal of the Arts.